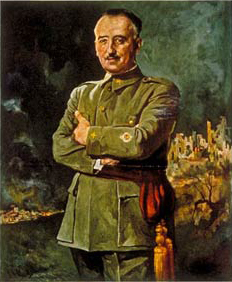 It's probably safe to say that Francisco Franco wasn't a very nice man. His oppression of linguistic freedom in Spain wasn't the worst thing he did, but we do write a blog about languages so it's obvious what we'll be focusing on today. did some very bad things. Despite being from Galicia, where both Galician and Spanish are spoken, Franco's hatred of the minority languages in Spain stemmed from a paranoia that the minorities would shatter his idea of a unified Spain and could communicate under his nose. The Second Spanish Republic had recognised Catalan, Basque and Galician, but Franco abolished the statutes in favour of Spanish (or Castilian), which became the only official language of Spain. Under Franco, schooling and the media were always in Spanish. The minority languages became even more threatened as the number of speakers they had dropped. 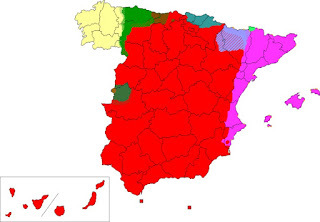 The red area is where Spanish is currently spoken. Other colours indicate the minority languages of Spain. The Basque language was threatened and could have been extinct by now had Franco's regime continued in Spain. Towards the end of his tenure as dictator "by the grace of God", the minority languages were almost never spoken in large towns and cities and were severely under threat in smaller settlements such as villages. Under Franco, Spaniards would be punished if found to be not speaking in Spanish. In Catalonia,some citizens would speak Catalan in their homes although it was punishable under law. However, Catalan was rarely spoken in the streets, at least not whilst under the watchful eyes of Franco's men. to be different from fascism. 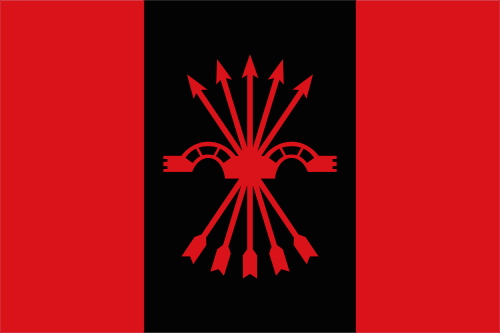 The effects of Franco's regime are still visible in Spain and the minority languages are still in a state of revival. Fortunately, neither Catalan nor Galician are considered to be endangered, while Basque is only considered to be vulnerable according to UNESCO. They would, however, be faring much better had it not been for Franco, his regime and the heavily-centralised and monolingual policies he enacted.